This was more a duty watch than a pleasure, as is case with many a slice of history we read about for years, but are otherwise reluctant submitting to. Its litany of firsts: DeMille's as director, if in co-helm capacity (with Oscar Apfel), the inaugural feature based in Hollywood, along with locations nearby, and an all-or-nothing gamble by the Jesse L. Lasky Co. to establish itself in long-form filmmaking. My curiosity was satisfied early on, leaving forty or so minutes to doze through, fast-forward, or think on other topics as Dustin Farnum and assorted ghosts played their drama out. To latter and its awkward progress, Farnum has disgrace hung on him by a rotter among English aristocracy, and so forfeits home and title to head U.S. west where life proceeds in the raw. There he meets bad hombres and an Indian princess who bears his papoose and makes the expected sacrifice so Dustin can reclaim back-home birthright and fiancé. DeMille thought enough of the property to remake it several times, The Squaw Man frontier-set equivalent of Uncle Tom's Cabin for 19th Century road-touring. Aspects of the yarn do compel; you'd not be remiss adapting it today, though obviously with changes. 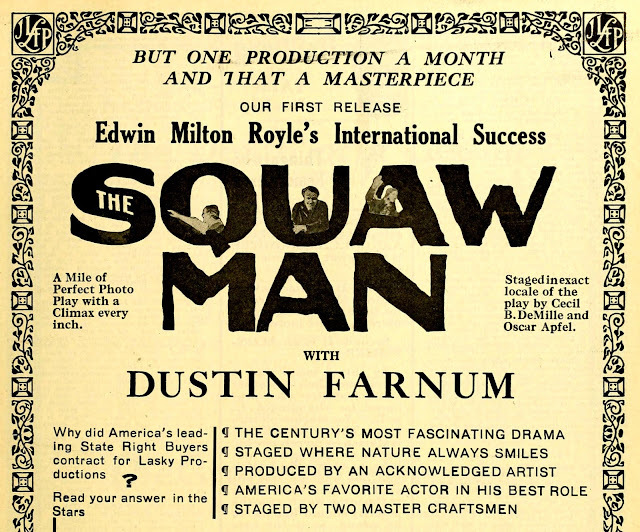 We can thank a miracle that The Squaw Man survives, as how many other features from that relic period remain? 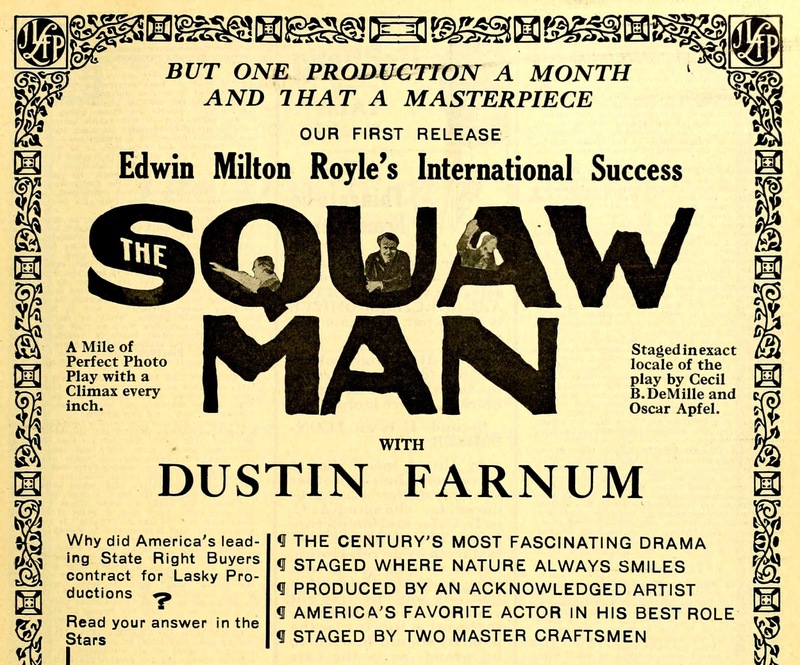 (certainly there are few others extant that Lasky produced) If nothing else, The Squaw Man left us the barn-site of filming, where silent clubs gather and old movies frequently unspool. The Squaw Man is one of those that's been famous a hundred years for being famous, even if not necessarily good, and deserves anyone's hour and fifteen minutes in respectful observance. Illustrations courtesy the great LANTERN site. "Respectful observance" sounds like one is sitting in a funeral home or a church instead of watching a movie. I have THE SQUAW MAN on the shelf here. Can't add or detract from anything you wrote.Perhaps better music might have brought it to life for you. Usually these things are scored like everything but a movie. 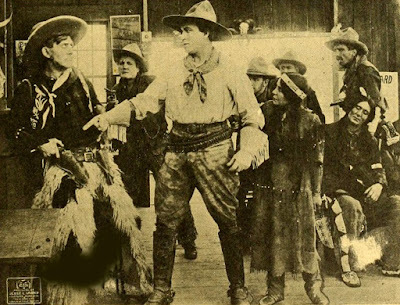 Then again John, you could watch Reginald Barker's THE BARGAIN (1914) and see a film that equals THE SQUAW MAN's century-plus status and still entertains an audience pretty darn effortlessly, making one ask the question, "would THE SQUAW MAN have been better with William S. Hart?". Come to think of it, Warner Baxter didn't improve THE SQUAW MAN's or Demille's fortunes much later on, even with sound and greater technical efficiency. Love your frank way of dealing with the downside of being can't-help-yourself (and it goes for me, too) love for "old" movies, as in your latest post re: "The Squaw Man". I've never seen it, but I can well imagine just exactly what you mean when you say it was a "duty watch"! As you probably know, there is a structure that has long been reputed to be a surviving set piece from this now TRULY old Hollywood landmark production, that being a large barn, or 'THE' barn, used to make the movie. I've never known nor have I deeply inquired into why or how this barn was used in the movie, or for the movie. Could it have been used as...a barn? With the cowboys or 'Injuns' riding around it? With a cowboy working near it? Or...or, what? For all I know, interior set-ups and sets were done inside it. I wonder if watching the movie has given you any insight about this? The point of mentioning it--at all--is that this very structure not only exists, it exists most conspicuously. It's been located right across the street, the street being Highland Avenue, from the world-famous Hollywood Bowl, in a small park that's tucked in there just beneath the roaring 101 freeway that runs behind and above it in downtown Hollywood. And, it has been the home of a museum of sorts, dedicated to movies generally. I cannot say what's on view inside because I have a confession to make: I've never bothered to visit the place. However? I've driven past it, on almost innumerable occasions. You almost can't visit Hollywood without driving down Highland Avenue (among its other most famous venues, including Hollywood Blvd, Sunset Blvd, or Vine Street, for example), especially at this location. I can attest that it is quite a LARGE structure, but otherwise about as formless as a barn would be expected to be. It's not painted red, like your classic 'way out West' barn, but something far more neutral...at least, in its latter-day form. Thought this might interest or amuse you. I think without having investigated that one could most likely turn up a page on the internet describing it and probably also picturing it. I will say that anything of that vintage that had anything to do with the colorful and immense history of Hollywood and The Movies, that still exists today much as it must have been 'back then', is ipso facto fascinating, even if it's a plain, old barn. For images and information I prefer sites from Brazil because the magazine feature alternate images that are not found in English language elements. In fact, there are many things I have never found in Lantern even though the magazines are great to be accessible.